Cinthia Lara patiently waited for her name to be called by one of the volunteers at Salvation Army’s Angel Tree Toy Shop. Lara smiled while talking about her four kids, ages 1 – 11, who will be receiving gifts this year despite hard times at home. Lori Ortegon also has experienced financial hardship, but thanks to Angel Tree, she will have gifts for her 13-month-old girl and 5-year-old son. CPS Energy was once again glad to partner with Salvation Army‘s Angel Tree program this year to help spread Christmas joy to 1,000 local children. For many children, the gifts they receive through the program will be the only ones they open on Christmas morning. This year, Salvation Army is benefiting 3,000 families and providing gifts to 7,000 kids through the Angel Tree program. Team members across the company collected thousands of gifts, including clothing, toys, bicycles and sporting equipment. After donating, 130 team members volunteered Dec 7-18 to assemble, organize and distribute gifts to local families at the toy shop. Customer service representatives Yvonne Andrews and Amanda Cobos, who assist customers over the phone in our Customer Call Center, enjoyed helping families in person at the toy shop. UED Foreman Leticia Ortiz and several volunteers from our Southwest Service District have volunteered for several years with Angel Tree. This year, the group was inspired to take their volunteer efforts a step further and collect donated gifts for 40 kids at the local Children’s Shelter. On Saturday, 15 team members took time out of their personal schedules to organize a fun holiday party for the kids. Volunteers from this same group organized a “spring cleaning” event at the Ronald McDonald House earlier this year. Our team members of Southwest Service District organized a holiday party for kids at the local Children’s Shelter. UED Foreman Patricia Garcia and UED Installer Daniel Garcia dressed up as Santa Clause for the festivities. The group barbecued a meal and assembled games for the kids, including a reindeer ring toss and a portable basketball game that they donated to the Children’s Shelter. 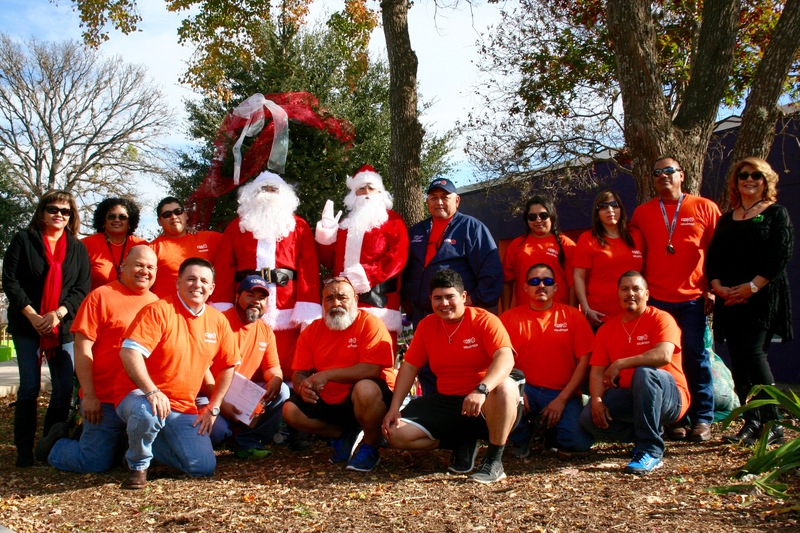 Ortiz said the holiday event provided another opportunity to benefit the community they enjoy working for each day. CPS Energy volunteers are ‘community strong’! Sam is part of the Corporate Communications team at CPS Energy.